In partnership with the Coalition to Lower Obesity in Chicago’s Children, Latinos Progresando, and Esperanza Health Centers, residents and other local partners conducted a walkability assessment and provided a report to the Alderman’s office and City departments requesting infrastructure upgrades and budget priorities to make the Pink Line - California eHub more walkable. Elevated Chicago began as a transformative idea for addressing Chicago’s stark racial and geographic concentrations of poverty and wealth, put forward by a bold group of sustainability, community development, and finance practitioners to the SPARCC national funding competition. Foresight joined this group as coalition-facilitators and proposal writers. Through our expert facilitation, and with the help of our systems-change approach and tools, the process aligned the visions of this diverse group of professionals and surfaced the most impactful leverage points, ensuring that the application would pursue the truly transformative change the competition sought. The resulting vision—Elevated Chicago—imagined an innovative collaboration of community-based and region-wide organizations working in the public, private and nonprofit sectors coming together to create a more racially equitable city and region using an approach called Equitable Transit Oriented Development, or eTOD. The result: a winning $1M proposal, plus millions of investment potential for Chicago focused on equity, health, and climate resilience. Our paths crossed with Elevated once again one and a half years after the winning proposal. In that time they had established a staff, a larger coalition of partner organizations, and a host of “community tables” and cross-site working groups, each of which was working on its own priorities, and with its own approach to community engagement. In need of greater cohesion among the practices of the organization’s many entities, deeper understanding of how neighborhood-based work can shift the forces that have historically held racial inequality in place, and a set of recommendations to decision makers in local government on best practices for community engagement, Elevated reengaged Foresight for a yearlong process of research, systems analysis, synthesis, priority alignment, and design. 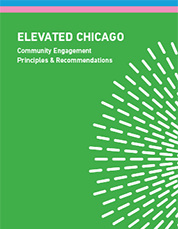 The process culminated in our creation of an actionable organizational workplan that incorporates the workplans of each of the community tables, framed with an innovative narrative-based structure built off of the stories and lived experiences of community members, and a set of community engagement principles and recommendations built from insights and effective approaches from frontline organizations from across Chicago. 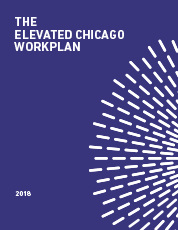 Today Elevated Chicago is working around seven CTA stations, with partners investing resources in eTOD programs and projects within the ½ mile radius around each station. The City of Chicago’s Transit Oriented Development ordinance and policy make areas surrounding transit stops especially attractive for development: eTOD helps ensure that these news assets and wealth will be enjoyed equitably by the area’s existing and longtime residents.